A British Library digitalizou integralmente um dos cadernos de notas de Leonardo da Vinci e acaba de o disponibilizar no seu website, juntamente com algumas notas introdutórias que podem ser acedidas através da funcionalidade Turning the Pages. 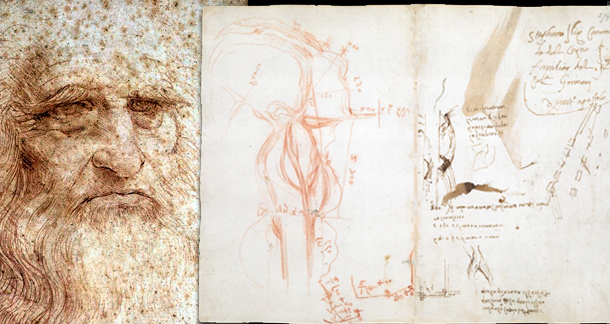 A collection of papers written in Italian by Leonardo da Vinci (b. 1452, d. 1519), in his characteristic left-handed mirror-writing (reading from right to left), including diagrams, drawings and brief texts, covering a broad range of topics in science and art, as well as personal notes. The core of the notebook is a collection of materials that Leonardo describes as 'a collection without order, drawn from many papers, which I have copied here, hoping to arrange them later each in its place according to the subjects of which they treat' (f. 1r), a collection he began in the house of Piero di Braccio Martelli in Florence, in 1508. To this notebook has subsequently been added a number of other loose papers containing writing and diagrams produced by Leonardo throughout his career.